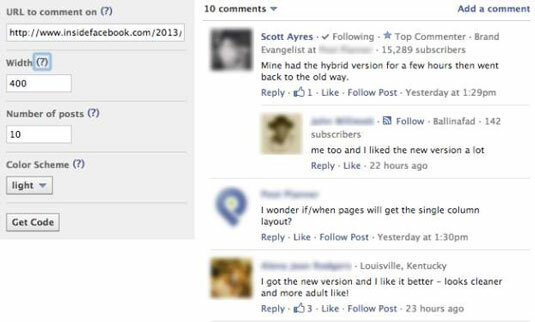 The Comments plug-in enables you to add a comments thread to any page on your website that allows visitors already logged in to Facebook to add comments. Users can choose to have their comments also posted to their Facebook profiles; those comments then show up in those users’ News Feeds, viewable by all their friends. By installing this plug-in, you allow users to leave comments and interact with you, and because their friends see that activity, you can drive more traffic back to your website. A mobile version of this plug-in automatically shows up when a mobile device user agent is detected. Visit Facebook’s Plug-in Page and click the Comments link. URL to Comment On: Enter the specific URL for the comment box. Width: Select the desired width of the plug-in in pixels. Number of Posts: Select the desired number of posts to display by default. You can add a Comments plug-in to any piece of content from which you want to solicit user feedback. Consider integrating it with product review pages or your blog, or you can use it to gauge user interest on website-related things like a new layout. If you integrate the Comments plug-in within your site, you need to monitor the comments closely and delete spam and malicious or overtly negative remarks.